PRINCETON, NJ -- Half of Americans today want the Affordable Care Act repealed or scaled back, down from 57% in January 2011. There has been essentially no change in the percentage of Americans who want the law expanded or kept as it is. The Affordable Care Act became an integral part of the ongoing wrangling between Republicans and Democrats that led to the partial federal government shutdown on Oct. 1, with conservative Republican lawmakers initially attempting to connect any vote on funding the government to defunding the ACA. A minority of Americans would agree that the law should be totally repealed, the functional equivalent of defunding. Mirroring the rancorous partisan debate over the ACA in Congress, views on the law are predictably split between Americans who identify as Republicans and those who identify as Democrats. A majority of Republicans (57%) say it should be repealed, with most of the rest desiring changes that would scale the law back. On the other hand, a little less than half of Democrats say the ACA should be kept as is, while 22% favor changes to expand the law. Notably, a not insubstantial 15% of Democrats want the law scaled back. 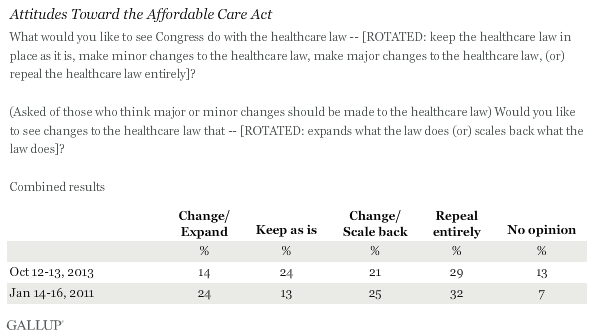 Consistent with surveys showing that Americans tilt more negatively than positively toward the Affordable Care Act, Americans remain more likely to say the law should be scaled back or repealed rather than kept as is or expanded, although only three in 10 want it repealed outright. Compared with January 2011, however, fewer Americans want the law repealed or scaled back, and more now don't have an opinion. Results for this Gallup poll are based on telephone interviews conducted Oct. 12-13, 2013, on the Gallup Daily tracking survey, with a random sample of 1,039 adults, aged 18 and older, living in all 50 U.S. states and the District of Columbia.